1. A team shall consist of not more than four players. Each team shall have a nominated Team Captain. The home team shall provide a Question Reader and scorer (except by mutual consent), but see rule 15. The home team shall also be responsible for supplying an area suitable for quizzing. 2. The team that wins the quiz match will be awarded two league points. The losing team will be awarded no league points. Both teams involved in a drawn league quiz will receive one league point each. Such league points will be collated by the League Secretary who will periodically produce a league table based on the performance of each league’s constituent teams, in which table teams tied on league points will be ranked in order of the number of match points scored (see rule 9b). At the end of the season, the team at the top of League Division One will be crowned League Champions. The bottom team in League Division One will be relegated into League Division Two, with the top team in League Division Two being promoted into League Division One for the following season. However, in order to keep the two divisions with roughly equal numbers of constituent teams, it may be necessary for the Committee to amend, or even waive the numbers of teams promoted and/or relegated. Such amendments will be brought before the League AGM for discussion before the start of the season. 3. All games will be played on Monday nights, starting at 8:30pm, except by arrangement of the Committee. Any team without opponents by 8:45pm will be able to claim the match and will be awarded two league points. For the purposes of the league table, the team will be deemed to have won the match by the average match points scored for in that team’s division to the average match points scored against. The offending team will be deemed to have lost the match by the same score. In this instance, the question pack must be returned, unopened, to the League Secretary or other Committee member. 4. League fees are decided by the Annual General Meeting each year and currently the system is of a fee per game, which is deemed to be fairest as the teams progressing further in cup competitions pay more. If a team defaults a match, for instance by not being able to raise a team for a particular night and being forced to cancel, the team still has to pay its match fee but furthermore by virtue of this Rule, they also pay the match fee of the opposition, to a) compensate them for the inconvenience of losing part of their fixture programme and b) to ensure that the League does not lose match fees due to this also. 5. Any charges levied on the Five Towns Quiz by our current bankers for dishonoured cheques presented by teams in payment for league fees or anything else, must be refunded by the offending team in addition to finding an alternative means of payment for that which they were trying to pay with the dishonoured cheque. 6. 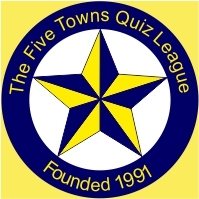 In consideration of the fact that during the entire existence of the Five Towns Quiz League, question packs have always been hand delivered and never posted (ie lost in the post is not possible), if a visiting team arrives at their fixture on a particular night and the question pack is lost, mislaid or other unavailable by the latest starting time (8.45pm), then this is deemed to be the responsibility of the home team (assuming that it is subsequently confirmed that the question pack is KNOWN to have been delivered) and the visiting team in most foreseeable circumstances will be able to claim the game and the 2 match points. 7. The question pack is normally shown to both Captains immediately before opening by the question reader, for them to satisfy themselves that it is not open or tampered with. If the question pack appears for the match at 8.30pm – 8.45pm and has obviously been opened or is indeed suspected to have been tampered with, then the game for league purposes shall be void and shall be referred to the Committee for consideration. One particular previously known scenario is that licensees and/or bar staff have opened questions on receipt, not knowing what they are and in that circumstance for instance, the game would be awarded to the visiting team. 8. The decision of the Question Reader is final. The only circumstances in which the Question Reader can be overruled is if the two Team Captains are in agreement that the Question Reader’s decision is wrong, and they are in agreement about the remedy, and only then at the exact time during the match of the dispute arising. If the Team Captains cannot agree, the Question Reader is the sole arbiter of any disputes. Notwithstanding the fact that the Five Towns Quiz League does not appoint Question Readers and/or scorers for every match, the Committee of the Five Towns Quiz League officially vests its powers of adjudication in the Question Readers appointed for the duration of a specific quiz match. a) Following a matter arising about which you feel an official complaint should be raised, the Committee of the Five Towns Quiz League should be informed within seven days of the matter arising. The complaint should be made in writing, addressed or delivered by hand, or sent by email to any member of the Committee. The receipt of such a complaint will force a Committee meeting to be held specifically to consider the matter. b) Following a complaint, Committee meeting and decision, the Committee will then inform the complainant in writing of the decision. There then follows a right of appeal by any party involved in the matter. c) If an appeal is received, this will be considered by the League Chairman and League Secretary. The result of this appeal hearing will be final and binding. d) By signing the scoresheet at the end of the quiz, the Team Captain accepts everything on the front of the scoresheet as a true and accurate record of the match, including the final score. 9. In case of any dispute over answers, the answer given on the question paper will stand. The only occasion when the answer given on the question paper can be overruled is by agreement of both team Captains – see rule 4 above. A note should be made on the ‘comments’ section of the scoresheet to this effect – the note should include the question number, and the answer accepted. 10. A player can only play for one league team during the season. Any player wishing to play in the Knockout Cup, Knockout Plate or Handicap Cup competitions must have played in at least one league match for that team in that season prior to the date of the cup / plate match. Any individual legibly named as Question Reader on a scoresheet is also eligible to play in a cup or plate match, subject to the ‘one team per season’ clause, above. Being named as a Question Reader on a scoresheet does not disqualify an individual from playing for a different league team for the first time, again subject to the ‘one team per season’ clause. A Knockout Cup, Knockout Plate or Handicap Cup match shall be forfeited by any team who plays a player later found to be ineligible for the match, according to this rule. 11. Match postponements are allowed only with approval of the Committee, which may be applied retrospectively on a case-by-case basis. 12. If a team plays with one or more players short, at the start of the quiz the team Captain shall inform the scorer which seat(s) is/are empty; the empty seat(s) shall be considered to be a player for the purposes of the individual rounds. 13. The quiz shall consist of ten rounds. If insufficient questions are supplied for the ten rounds, the match shall be considered void for league purposes; however the teams may play the match through as a friendly fixture. a) The match will start with the home team Captain tossing a coin, and the away team Captain calling ‘heads’ or ‘tails’. The team winning the coin toss has the choice of answering the first question in each round (‘going A’) or answering the second question in each round (‘going B’). b) Rounds 1, 2, 4, 7, 9 and 10 are rounds of team questions, where discussion of the answers is permitted. A team’s answers should be given to the Question Reader by the Team Captain. The Question Reader should accept the first answer that he is given by the Team Captain. Two match points are awarded for the correct answer to a question given by the team to which the question was originally asked; in the event of a wrong answer or no answer, a correct answer by the opposing team (bonus) is awarded one match point. c) Rounds 3 and 6 are individual rounds, with questions being directed to, and being answered by, specific individuals in each team in an order notified to the Question Reader and scorer at the start of the quiz match. No conferring between team members on either side, and no use of pens or other writing implements is allowed during individual rounds, with the sole exception of the individuals on each team who may decide to keep track of the scores during the quiz match – these individuals may use a pen or other writing implement to make a note of the score only after each question is answered, and before the next question is asked. A correct answer given by the individual to whom the question is initially addressed is awarded two match points. Should the individual to whom the question is initially addressed either answer incorrectly, or fail to provide an answer, the question is passed over to the individual on the opposing team sitting directly opposite the individual receiving the original question. A correct answer from this individual is awarded one match point. In the event that neither individual supplies a correct answer, the question is then offered to any one of the other three team members of the individual that originally received the question but not that individual for a second time. Again, no conferring is allowed, and team members should devise a method by which they can indicate, silently and without using writing implements, whether they know the answer to the question or not. The team Captain should nominate one of the remaining individuals to answer the question on behalf of the team. A correct answer at this stage is worth one match point. In the event that the answer given is wrong, or no answer is given, the question is finally passed over to the opposing team again but not the individual who had the first bonus attempt. One individual from the bonus team's three remaining individuals can answer the question following the constraints detailed above. A correct answer at this stage is also worth one match point. d) Rounds 5 and 8 are written team rounds. In these rounds, each team is supplied with a piece of paper on which is written one or more questions. The team members may confer and have three minutes to answer as many of the questions on the paper as possible. For the current league season, the format of the written rounds is that round 5 consists of four questions, requiring one, two, three and four answers respectively; one match point is awarded for each correct answer. The answers provided for each question requiring more than one answer do not have to be in the same order as the answers on the Question Reader’s answer sheet, unless specified. Again, for the current league season, round 8 is a round with five questions, each question being worth two match points. In this round, the answers to the first four questions are linked in some way, with question five being “What is the link between the answers to the above four questions?” or similar phrasing. e) There is a limit on the amount of time that a team or individual can take to answer a question. Question Readers should allow 45 seconds before prompting the team / individual for an answer. If an answer has not been given one minute after the Question Reader has completed his or her first reading of the question, the Question Reader should hand over the question to the opposing team / individual for a bonus chance. In the case of bonuses, the Question Reader should prompt for an answer after 15 seconds, and hand back an individual question or give the answer to a team question after 30 seconds. Three minutes are allowed for the two written team rounds, rounds 5 and 8.
f) At ‘half-time’ in the quiz, ie after round 5 is complete, but before round 6 has started, the Team Captain of the team trailing in the quiz has the choice to change the questions his or her team will receive; either change from ‘going A’ to ‘going B’ or vice versa, or remaining as is until the end of the match. Should the scores be tied after round 5, no such choice should be offered to either team Captain. v) the Question Reader shall toss a coin, with the team Captain that lost the toss at the start of the quiz calling ‘heads’ or ‘tails’. The match will be awarded to the winner of the coin toss. g. In drawn matches in the Handicap Cup, where one team has received a larger handicap than the other, the drawn match will be awarded to the team with the larger starting handicap. 14. It is the responsibility of the winning team to return the scoresheet to the League Secretary. The scoresheet should be returned in or before first post on the Thursday directly following the match. Should a scoresheet not be received by that time, the Committee of the Five Towns Quiz League reserve the right to deem the match to be a 0-0 draw, and amend the published league table to reflect that fact. In order to facilitate publication of the results in the local press, the League secretary also requests that the result, and which team took questions ‘A’ and ‘B’ be communicated to him by telephone or by SMS straight after the conclusion of the match. Please note that this communication of the result is not intended to replace the return of the scoresheet, which is required for calculation of the individual scoring tables. Team Captains are requested to keep a separate note of which individual players sat in which seat, and their scores for the individual rounds, so these figures are not lost if a scoresheet is lost in the post. 15. The Committee of The Five Towns Quiz League reserves the right to appoint a question reader and / or scorer for any fixture it deems necessary. If the Committee formally appoints a question reader and/or scorer, they will be provided by the Committee with a letter, on headed paper, indicating this to be the case and the appointed question reader and/or scorer will produce this letter on demand of the home team Captain. However, if an individual is formally appointed in this manner, this will not make that individual eligible to play for either of the participating teams in subsequent Knockout Cup, Knockout Plate or Handicap Cup fixtures, unless previously qualified as per rule 6 above. Occasionally, Committee members or others will attend league matches without a letter of authority; they may act as question reader or scorer in this instance with the agreement of the home team Captain. 16. All new teams entering the Five Towns Quiz League for any season for the first time will be required to complete and sign an entry form subsequent to the Rules agenda item at the Annual General Meeting and prior to the first league match and also to pay a deposit against their upcoming league fees of £20.00. This entry form will be signed by the Captain and confirms that the team recognises accepts and agrees to be bound by the Official Rules of the League, of which this Rule, Rule 16 forms a part and intends to fulfil its fixtures and financial obligations. Any team folding before the conclusion of any season will be required to pay all league fees due up to that point. 17. The liabilities of a team properly affiliated by their entry form to the League for any particular season are joint and several. This means that liability for, for example, match fees, ie what it costs to play in the League, is jointly and severally assigned to all members of that team who have appeared on a scoresheet by the end of that season, not just the Team Captain and not the Licensee of the home establishment (unless of course that Licensee is a playing member as well). It is accepted that occasionally Licensees agree to pay league fees, but strict liability remains with the members of the team and it is their responsibility to make sure that fees are paid and in a timely manner. 18. Similarly, regarding safekeeping and return of trophies, any trophies won by and presented to a team must be returned to the Secretary a minimum of two weeks before the Finals Night they are to be required for. Any loss of annual trophies or damage to trophies must be paid for and again, liability in this regard rests jointly and severally with the registered playing squad for that season. 19. The Committee of the Five Towns Quiz League believe that the Five Towns Quiz League should be an organisation that people are proud to be members of, and also believe that the teams in the league should agree with and commit to ‘The Spirit of the Game’. ‘The Spirit of the Game’ should cover all misdemeanours not specifically covered in these rules. Although difficult to define, ‘The Spirit of the Game’ is something that all individuals and teams should be aware of, and should act within at all times during league and cup quiz matches. The Committee of the Five Towns Quiz League reserves the right to take whatever action is deemed appropriate against individuals and teams transgressing ‘The Spirit Of The Game’, as well as foul play specifically covered in these rules. Note – the following definitions form part of the League Rules. Team Captain – the individual of the four in each team who has responsibility for tendering answers to the question reader. For teams playing a squad rotation system, where members take turns to sit out on a weekly basis, the squad captain may be sat out in any given week. Notwithstanding this fact, for the purposes of these rules the de facto team captain is the person playing the quiz who tenders the answers to the question reader. Committee and Committee member – the organisation that runs the league, and the individual members thereof. The committee will meet at least once every two months during the league season, more often if necessary, and can also be called to meet if a complaint is received by any committee member. The committee will all be up for election at each year’s AGM. An EGM will be called in the event that one is demanded, in writing, by a number of teams greater than 66% of competing teams. The Committee will consist of a minimum of three people; a League Chair, a League Secretary and at least one other member. The committee will be considered to be quorate if at least of 60% of its membership is present at a meeting. If a meeting is deemed quorate under these conditions, it will be the responsibility of the League Secretary to communicate the decisions of the meeting to other committee members as soon as reasonably practicable. Question Pack – a sealed, tamperproof envelope (or ‘normal’ envelope with stickers over the seals) containing the quiz questions, scoresheet, blank answer sheets for rounds 5 and 8, plus any communication from the league to each team; for instance the previous week’s results, details of cup draws, etc. The question pack should be shown to each captain by the question reader at the start of the quiz, so they can be satisfied that the pack seals are intact. Scoresheet – the document issued by the league in each question pack for completion during the quiz, By the end of the match it provides an accurate record of match points scored by each team, as well as giving details of scores for individual competitions and being used as reference in the event of a tied cup match. Knockout Cup – the premier knockout tournament of the league. Plate Knockout – the knockout tournament to be played for by teams eliminated in the preliminary and first round of the Knockout cup proper. However, teams who forfeit a preliminary or first round proper match in the Knockout Cup will be ineligible to play in the Knockout Plate competition. Handicap and Handicap Cup – the end of season knockout tournament. All teams are given a handicap score based on their final league match points total, relative to the league champions. ‘sitting directly opposite’ – the team captain submits a list of the players in his or her team to the question reader and scorer before the quiz starts. These players names are entered onto the scoresheet by the scorer. For the purposes of individual rounds, the first named player on team A is deemed to be sat directly opposite the first named player on team B, the second named player on team A is deemed to be sat directly opposite the second named player on team B, and so on – irrespective of their relative positions around the table. Question Reader – the individual who reads the questions, and determines whether answers tendered are correct. Main responsibilities; showing the unopened question pack to both competing team captains; reading the questions as printed on the question sheet; acting as the arbiter as to the validity or otherwise of answers tendered; ensuring that the questions are answered in a timely fashion by both teams (if a separate scorer is not available); the committee's representative during play. The decision of the Question Reader is final. The only circumstances in which the Question Reader can be overruled is if the two Team Captains are in agreement that the Question Reader’s decision is wrong, and they are in agreement about the remedy, and only then at the exact time during the match of the dispute arising. If the Team Captains cannot agree, the Question Master is the sole arbiter of any disputes. In the vast majority of cases, the answer given on the question sheet is the only acceptable correct answer. If any alternative answer is accepted by both team captains, the question number and accepted answer should be written on the rear of the scoresheet. The setter may, for answers where more than one word is given, mark out one or more words of the answer in bold, italic or underline, or alternatively place one or more words in brackets. In instances such as this, the marked (or unbracketed) words are essential to a correct answer. If the answer has one or more words thus marked, inform the teams prior to asking the question. If after being so warned, the answering team volunteers incorrect extra information, this will invalidate the answer. Q: Which footballer played in his first FA Cup final in 1971, and his last in 1987? - Answer: Ray Clemence. Before reading the question, inform the teams that you are looking for the surname only, or that the surname is acceptable. Team Answers “Clemence” – correct. Team Answers “Ray Clemence” - correct. Team Answers “Paul Clemence” - incorrect. Pass over. Q: Who is the only US President to be elected to serve four terms of office? Team Answers “Roosevelt” - ask for more. Team Answers “Theodore Roosevelt” - incorrect. Pass over. Team Answers “Franklin D Roosevelt” - correct. Team Answers “Franklin Roosevelt” - correct. Please do not be tempted to give teams 'the benefit of the doubt'. If you think an answer is unacceptable, say so.